International Law Commission, July 2018. The International Law Commission was established by the General Assembly, in 1947, to undertake the mandate of the Assembly, under article 13 (1) (a) of the Charter of the United Nations to "initiate studies and make recommendations for the purpose of ... encouraging the progressive development of international law and its codification". Open letter from the Chair of the ILC regarding the arrest of Prof. Maurice Kamto (former member of the Commission). * Not scheduled to be considered at the seventy-first session in 2019. 17 April 2019 The fourth report on crimes against humanity by Sean D. Murphy, Special Rapporteur, has been issued (A/CN.4/725 + Add.1). 12 April 2019 The Topical Summary of the debate in the Sixth Committee on the 2018 ILC report, has been issued (A/CN.4/724). 8 April 2019 The report containing comments and observations received from Governments, international organizations and others on crimes against humanity, has been issued (A/CN.4/726). 1 April 2019 The fourth report on peremptory norms of general international law (jus cogens) by Dire Tladi, Special Rapporteur, has been issued (A/CN.4/727). 24 January 2019 The provisional agenda for the seventy-first session of the ILC is now available (A/CN.4/723). 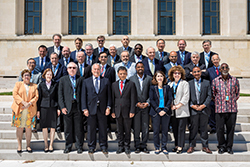 17 August 2018 Advance version of the 2018 ILC report is now available. 10 August 2018 The Commission adopted its report of the seventieth session as a whole and thus concluded its work for that session.